Cooler weather means it is soup time, not just the broth type ones we eat throughout the year, but those thick, luscious tasty ones. This is the third and probably final pumpkin soup I will try (if you have been following I was trying out pumpkin soups for a friend of mine). This one is my favourite. 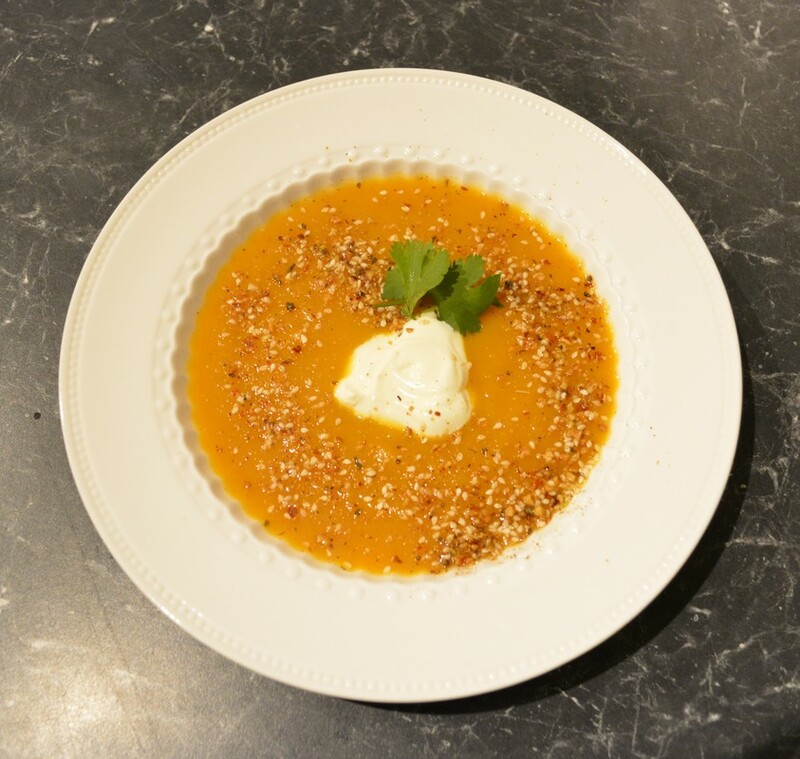 I love the spice through it, I love the addition of the yoghurt and the dukkah. The garlic bread works beautifully with the soup. I again chose to bake the pumpkin first to give a more intense flavour, but you can just add the pumpkin with the stock and simmer until soft, about 20 minutes. Add 2 tablespoons of the oil in a baking tray. Toss the pumpkin in the oil and bake for 30 minutes or until golden. Heat the remaining olive oil in a large saucepan over medium heat. Add the onion, cook, stirring, for 5 minutes until golden. Add the cumin, cook, stirring, for 1 minute. Add the baked pumpkin and stock, bring to the boil, reduce heat and simmer for 20 minutes. Turn off the heat. Allow to cool slightly, then blend in batches until smooth. (I prefer to use a stick blender in the saucepan, much easier, but you can miss a bit, but my family don't care). If using a blender, return the soup to the pan, taste for seasoning, reheat if needed. Cut the Turkish bread in half, lengthways, grill or toast it until golden. Rub the garlic on the cut side of the bread, drizzle with some of the extra virgin olive oil. 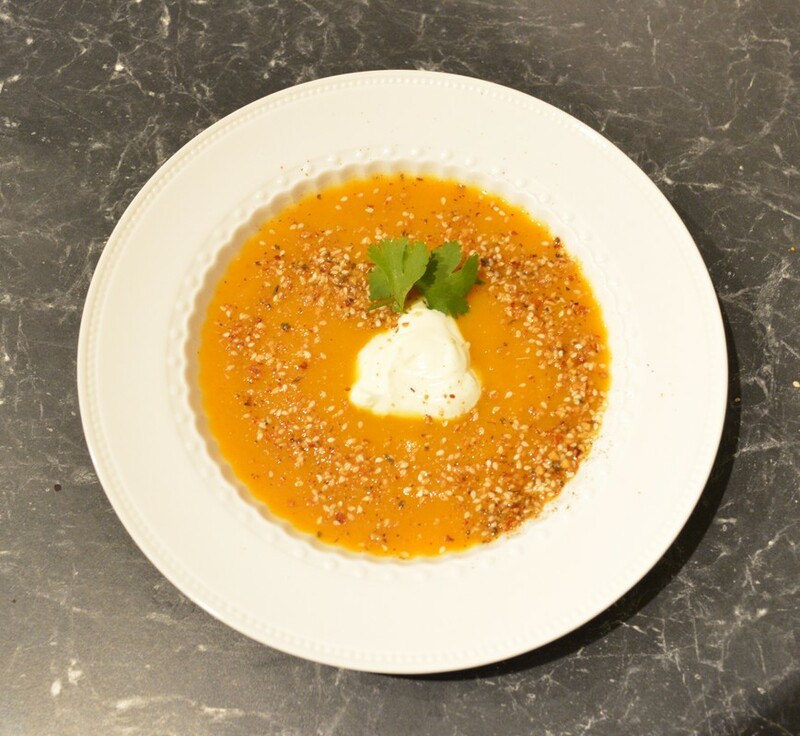 Ladle the soup into bowls, add a dollop of the yoghurt and sprinkle with the dukkah. Serve with the garlic toast.